2014 – The Hottest New Hotels! 2013 – The Hottest New Hotels! Daily Event Calendar: What’s on? This area combines modern design and architecture with old historic warehouses along the waterfront. The Oostelijk Havengebied (Eastern Docklands) is situated east of the Amsterdam Central Station. The history of this neighborhood goes back to the seventeenth century, the so called Golden Age. Amsterdam became a wealthy city because of the international and overseas trade. In the nineteenth century, the former docks built on the Eastern Islands became too small. De ‘Oostelijke Handelskade’ (quay) was built to welcome larger cargo and passenger ships from the Americas, Africa and the former Dutch East and West Indies. The decay of the Oostelijk Havengebied started after the Second World War. Aircrafts made their entry and became popular for both people and cargo. 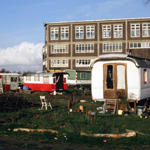 From 1970 to 1985 the Eastern Docklands became an area for city nomads, artists and squatters living in caravans, old buses and tents. In 1986 a turnabout took place. The municipality wanted to stimulate private housing and luxury rented houses. Modern architecture and urban allure became important for the development of this area. Old warehouses were re-used for apartments next to new residential blocks. A great example for the new design is the street ‘Scheepstimmermanstraat’, where citizens themselves were allowed to design their new homes. The ‘Pythonbrug’ (Python Bridge) is another example of modern architecture, trying to attract new residents of this new philosophy of the city. The area consists of several islands, each with its own atmosphere. Pols Potten and Sissy Boy Homeland are popular interior design and living shops in the area of Oostelijk Havengebied. Both shops are located in a former harbor building, called ‘Loods 6’. Many other design shops are located in this building as well. 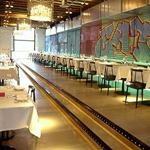 In this area food lovers can enjoy the Amsterdam version of Jamie Oliver’s Restaurant ‘Fifteen’. Tapas are served in Restaurant Puerto Pata Negra in opposite of the Lloyd Hotel. 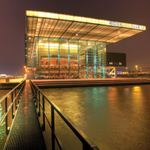 A spectacular building is the ‘Muziekgebouw aan ‘t IJ’ on the banks of the IJ River. The music performed in this concert hall always aims to be both inspirational and innovative with a contemporary program. In the same building the ‘Bimhuis’ is located. Over 300 concerts annually, the Bimhuis provides a perspective on Dutch and international music, in which a variety of jazz and improvised music can be enjoyed. 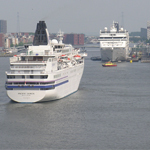 The Passenger Terminal Amsterdam (PTA) is the Amsterdam’s official port for cruise ships. Amsterdam is becoming an increasingly popular cruise ship destination. The PTA welcomes about 300,000 passengers on an annual basis and is also popular as an event venue. It offers many facilities for the cruise ships and their passengers; luggage lockers, shops, roof terraces, ATM machines, internet consoles and much more. Please Register or Login in "My Dashboard"
Add an event for free! Please first register or Login in "My Dashboard"